Thanks to everyone who has purchased a ticket to our Auction Saturday night. If you haven’t please do so by Friday for the discounted rate. It is shaping up to be a great evening! Below is a link to purchase your tickets. Please try to add the names of your guests in the notes section and your child’s teacher (if you’ve already purchased tickets, don’t worry if you didn’t include this information). We’ve had a few inquiries about adding last minute items to the silent auction. Yes! We will take last minute items. If you have something, please contact Amy Holland at amytholland@live.com. Below is a link for families to fill out if you would like to provide input as we begin to make class placement decisions for next year. As always, we do not accept requests for certain teachers or requests to not have your child assigned to a particular teacher. However, your input is valued as we make our lists. Below is a link to the form. We ask that you provide input by next Friday, May 3rd. 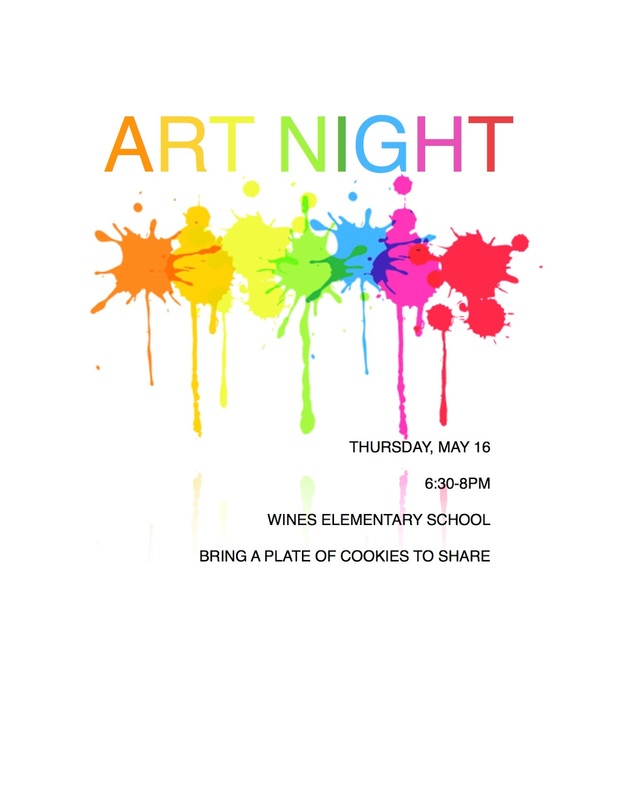 Join us for Art Night to celebrate our Wines student artists! 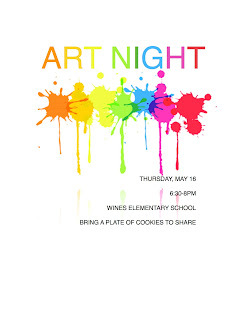 Thursday, May 16th from 6:30-8PM. Bring a plate of cookies to share. We will enjoy artwork created throughout the school year and the new PTO sponsored murals. All students will have artwork in the exhibition. As is usual this time of year, we have lots of news to share. 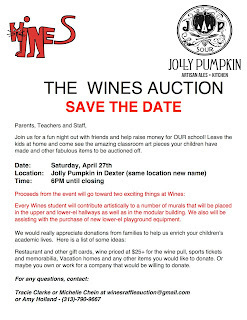 We are just over a week away from our annual Wines auction at the Jolly Pumpkin Artesian Ales and Kitchen in Dexter (formerly Null Tap House). The event is next Saturday evening and tickets are on sale now. Please go to https://squareup.com/market/wines-elementary-school-pto to purchase your tickets. The classroom projects that are auctioned off during the live auction are complete. In today's email find a link to see all of these fantastic projects. The live auction, in my opinion, is the highlight of the night! We hope to see you there next Saturday. Our students will be taking part in Lunches with Love, our annual community service project to support Food Gatherers, next week. Look for information in your child’s Wednesday Folder tonight. As part of the project, kids will be packing lunches next week. We can always use volunteers. In today's email I sent a link to the schedule of when classes are packing. Feel free to join us! Interested in Helping at Lunch? We are always hiring lunch supervisors at Wines. If you or someone you know is interested in a flexible mid-day job that includes working in our cafeteria and outside at lunch recess, we are hiring! Interested candidates can contact me directly and I will put them in touch with Human Resources. If you are not interested in the paid position but would like to volunteer, please let me know of your available days and I will pass this information on to our noon hour coordinator. It’s never too late for some friendly reminders about our parking lot. Please make sure you are pulling up as far as you can before letting your child out of the car in the morning. In addition, the process of drop off needs to be safe and efficient. Parents should not need to get out of the car to help kids out or give one last hug goodbye. You are always welcome to park and walk your child to the building to do this. At pick up time, please also pull all the way up and wait for your child to come to you. Do not get out of your car. Kids are not allowed to head up the sidewalk toward the baseball diamond to find cars and need to be picked up in front of the building. Finally, just a reminder that our crosswalk can be a very unsafe place and students are NEVER allowed to cross without an adult. If you are escorting your child across the lot, please utilize the crosswalk and don’t cross in other areas. Spring was here yesterday, what happened?? Here is all the news for the week. The April PTO Wines Times newsletter is ready. Below is a link. Disability Awareness Workshop - LAST CALL for volunteers! Our annual Disability Awareness Workshop is next Wednesday, April 17. We're in need of a few more parent volunteers to help out with this wonderful event for our 4th grade students. We especially need ONE more volunteer with a van or truck to pick up and/or return the workshop equipment. You do not have to be a parent of a 4th grader to volunteer! Our annual Wines “off site” Auction is coming up! Tickets are on sale now. Please go to https://squareup.com/market/wines-elementary-school-pto to purchase yours. We also need volunteers to help the event go smoothly. If you can help out, please go to https://www.signupgenius.com/go/10C0E4BA5A929AA8-wines to sign up. It’s easy to enjoy yourself at the event and help out at the same time! There has been some confusion regarding the hot lunch menu. Each school has a day where Dominos “Smart Slice” pizza is served. For Wines, our day is Thursday. On the menu, you’ll notice Thursday has the menu for what other schools not having pizza have on Thursday’s. Disregard the Thursday menu item as we have Dominos Pizza that day. The Ann Arbor Public Schools will provide a school safety update for parents and guardians on Tuesday, April 16, 6:30-8pm in Pioneer High School's Annex. This meeting will include a description of the ALICE intruder protocol that our staff is trained in well as an update on the school safety assessment and the upcoming visitor management system. An officer from the Ann Arbor Police Department will be joining the meeting as well. We hope you can make this session on Tuesday, April 16, 6:30 at Pioneer's Annex to learn more about our commitment to student and school safety. The Annex is located off the main Stadium Bvld. entrance or via the doors off the main parking lot. Disability Awareness Workshop - We still need MORE volunteers! Our annual Disability Awareness Workshop is fast approaching! It will be on Wednesday, April 17. We're in need of more parent volunteers to help out with this wonderful event for our 4th grade students. We especially need assistance from those with a van or truck to pick up and/or return the workshop equipment. You do not have to be a parent of a 4th grader to volunteer! Everyone should have received an email yesterday from Dr. Swift with a link to the annual parent school climate survey. Please take a minute to complete the survey. This gives us great information about the things we are doing well and the areas where we can continue to focus on improvement. 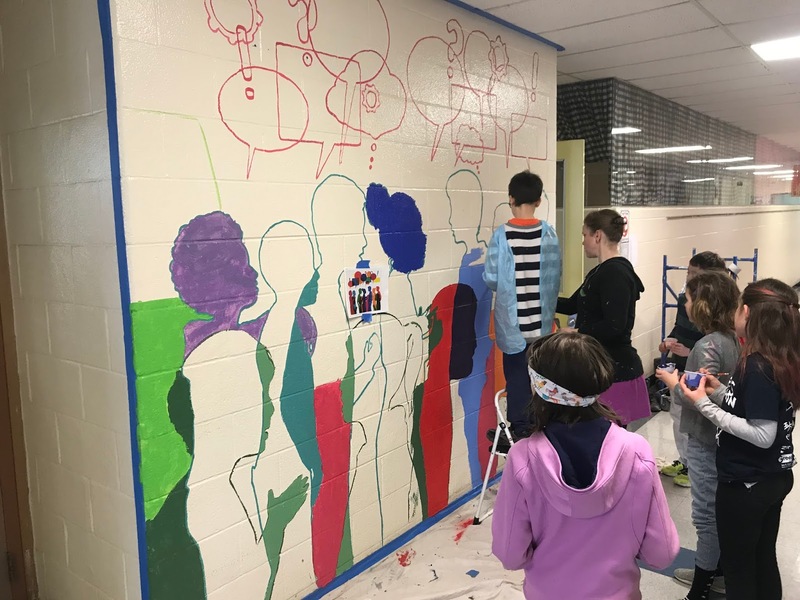 Our mural project in collaboration with Treetown Murals has begun. The fifth graders completed their mural in the Modular building yesterday and the 3rd and 4th graders have begun one of the two murals in their hallway today. 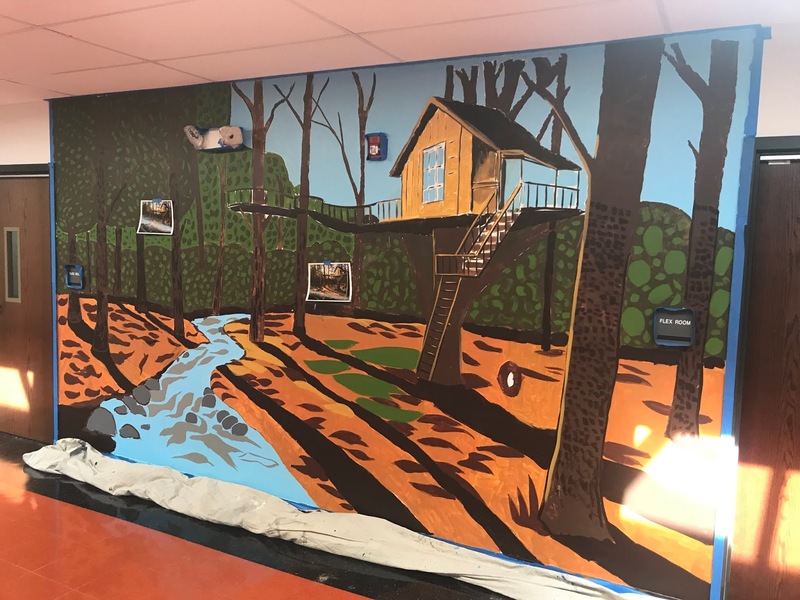 By the end of the month we’ll have five murals in the hallways at Wines that EVERY student will help paint. Big thanks to our PTO for supporting this project. Below are a couple pictures of the progress. The mural project is a perfect example of the types of things we do at Wines because of the support of our community. To that end, one of our most important (and most fun!) fundraisers takes place later this month. 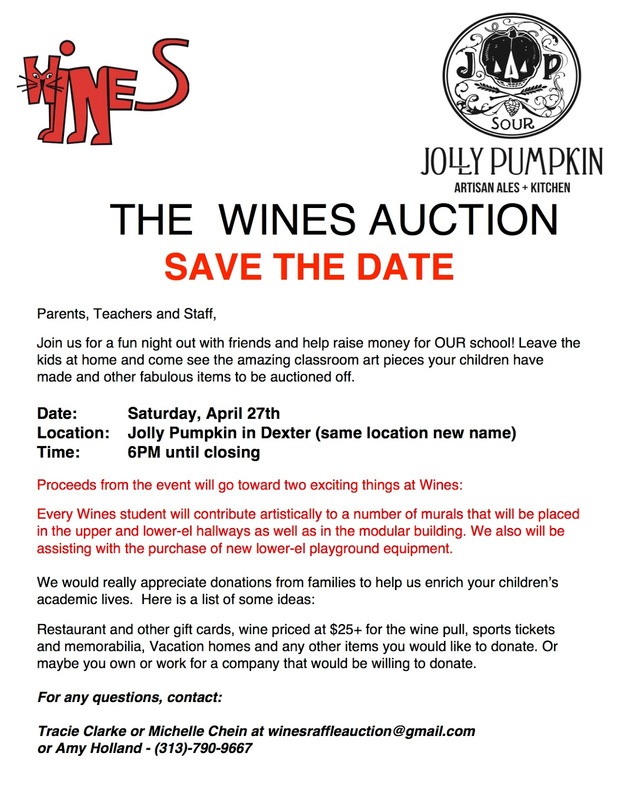 Please mark your calendars for the adult only Wines Auction (silent and live) on April 27th at the Jolly Pumpkin in Dexter. With the weather beginning to get better, I hope we see more kids walking to school and waiting outside for the bus in the morning. We really want to reduce the amount of unnecessary car traffic in our lot. So let’s take advantage of warmer temperatures and encourage our kids to walk to school if they live within distance or spend the time outdoors waiting for the bus! Thank you.